Excerpt: Video cameras are seemingly everywhere. Chances are you have already been recorded dozens of times this week, while leaving your home, getting into the car, train or bus, while driving, bicycling or walking to work, and, of course, while shopping. Others are recording us — all the time. But what about our own observations? Are we recording, too? Is there a camera attached to your microscope? Chances are there is. Does it record video and audio, and is it recording every time you are using it? Probably not, but this technology is here, relatively inexpensive and readily available. Abstract: The authors characterized the chemical composition and morphology of minerals in rock samples and processed products from two former talc mines owned by the R.T. Vanderbilt Company (RTV) in the Gouverneur Mining District in New York State. The main mineral phases within these samples are tremolite, anthophyllite and talc with serpentine, quartz, calcite, and diopside. Bulk analyses of the samples were performed by powder X-ray diffraction (XRD) for structural phases and by X-ray fluorescence (XRF) for bulk chemical composition. Precise compositional data of individual grains were collected by wavelength dispersive spectroscopy (WDS) using an electron microprobe. Mineral formulas were calculated from the resulting weight percent oxides. The morphology of the different mineral phases was observed with backscatter electron (BSE) images and polarized light microscopy (PLM). All of the mineral phases analyzed have near end-member compositions. The compositions and morphology of the minerals do not vary significantly between the two mines. Tremolite occurs in the samples mainly as unaltered, blocky crystals. Anthophyllite mainly occurs with an acicular texture and a series of fractures perpendicular to the long axis of the crystal. Talc occurs both as platy crystals and as fine-grained asbestiform particles as alteration products of primarily anthophyllite, which occurs in a non-asbestiform habit. Excerpt: Today’s well-funded research into the human mind is founded more on myth rather than a curiosity for exploring what goes on inside the brain’s cells. Abstract: Fusible art glass that has been cut on a diamond saw will show unsightly evidence of the cuts when it is fused. Visible trails called “veils” appear in the melted material corresponding to the the sawn edges, or “kerf, “ made by the saw blade. This can ruin an otherwise beautiful art work and create limitations for artists in the recycling and maximum use of their raw material. A microscopical study was done to examine the veils generated in this manner. The veils are streams of tiny bubbles that form as the cut edges melted into the body of the work. Various actions were investigated that artists might take to reduce or eliminate the problem. Boiling the diamond-cut glass scraps was found to greatly reduce the number of bubbles formed and greatly improve the appearance. The mechanism for the change in the glass is discussed. 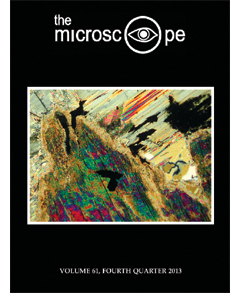 Copyright © 2013 Microscope Publications, Division of McCrone Research Institute. All rights reserved.